During the week of the 19th July 2017, one of our fellow Mexican foodies, Chef Ricardo Palomar, brought the Hilton Sandton’s executive chef: Stuart Cason, to Azteca to source ingredients for an authentic Mexican dinner that they were planning to have at the hotel for Wine Connect.We were so excited to share our products, food culture and memories with them. It was a real pleasure to be one of the suppliers for the event. From the start, Ricardo had a very strong vision of the food experience that he wanted to create – an authentic Mexican party feast that is still approachable for even the most uninitiated palette. This meant that, begrudgingly, he started the meal with canapés of mini hard shell tacos. While not strictly authentic Mexican, they were delicious and beautifully presented and accompanied by refreshing white wine margaritas. 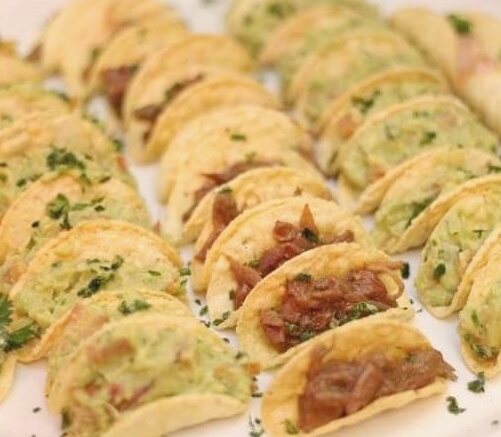 Mini tacos filled with a choice of chunky guacamole, shredded beef -‘Tinga de res’- con chipotle and ‘camarones al ajillo – braised shrimp with garlic. We were greeted at the tables with a healthy portion of Ricardo’s homemade red salsa and Azteca tortilla chips and the event was officially opened. Ricardo introduced the menu and Mr C. P. Conradie from Conradie Penhill Artisanal Winery introduced the wines that he had chosen to pair with the dinner. They were all lovely! To start off the main meal, we had Pozole; a traditional hominy soup. This version was made with pork, garnished with shredded lettuce, radishes, chopped onion, a sprinkle of oregano and a dash of lime juice and served with a tostada on the side, of course. Pozole takes me back in time to family Sunday lunches in Mexico. Real comfort food! 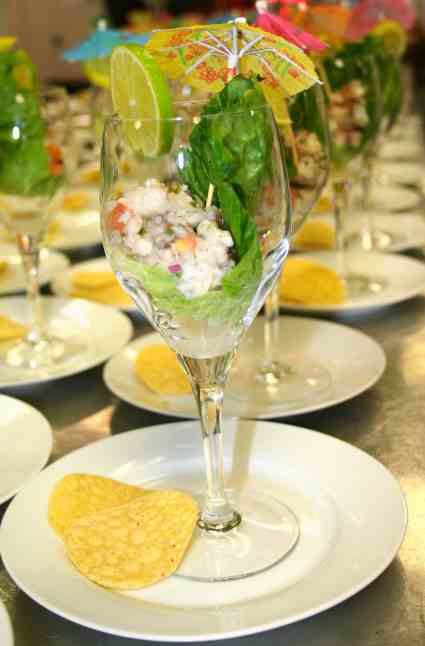 A refreshing Sea Bass ceviche was served next. The presentation was impeccable. 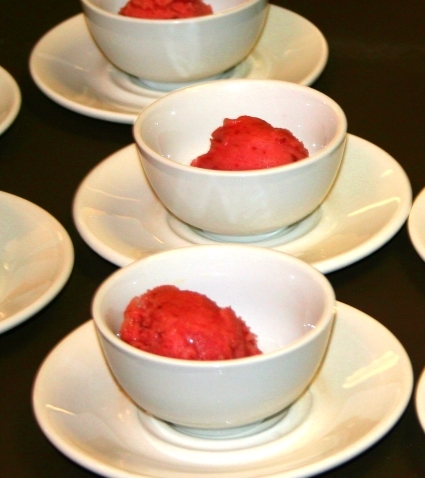 To punctuate the meal and cleanse the palate between the fish and the meat course, a simple Jamaica (hibiscus flower) sorbet was served. Jamaica tea is very tart and has a deep red colour. This with a bit of sugar gave a tangy and sweet sorbet. It was very refreshing. 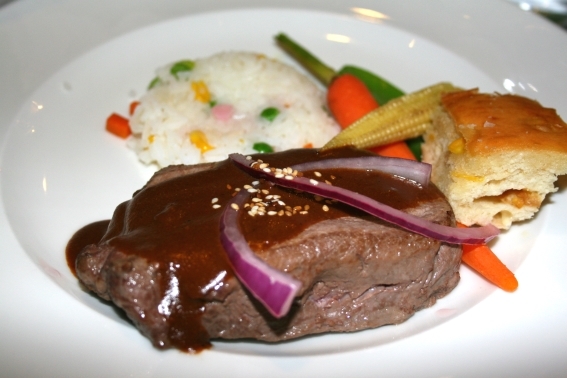 After a bit of fun with a prize draw and more discussion about the food and wine to come, the main course was served – sous vide kudu steaks served with my favourite red mole sauce, white rice, corn bread and steamed vegetables on the side. Mole is always best served with rice. You may think; “Kudu? Mexican?? No way! !” and you would be right. However, kudu was the best analog for a type of Mexican buck that is delicious with the mole sauce. The end result really did the original dish proud! 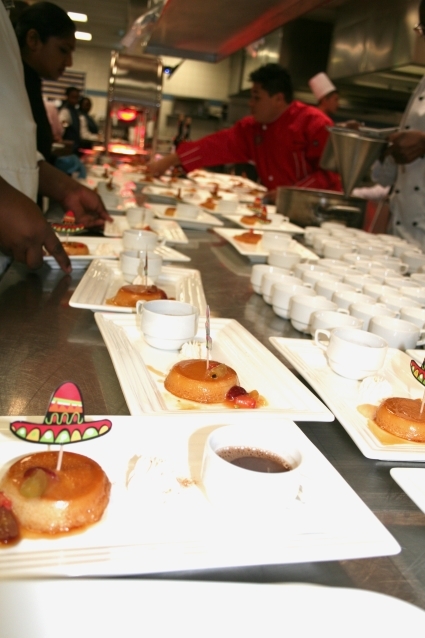 To round off the evening, Ricardo served a perfectly balanced Mexican flan for all the sweet lovers and champurrado – a traditional drink in which the chocolate is mixed with hot water instead of milk. The champurrado was a bit lighter so as to compliment the rich, creamy flan. We greatly enjoyed the meal as well as the company. Very well done Ricardo, I was honored to have been invited to sneak into the kitchen and pre-taste your food!